When I entertain family and friends and home, I like to focus on menus that can be made in advance. 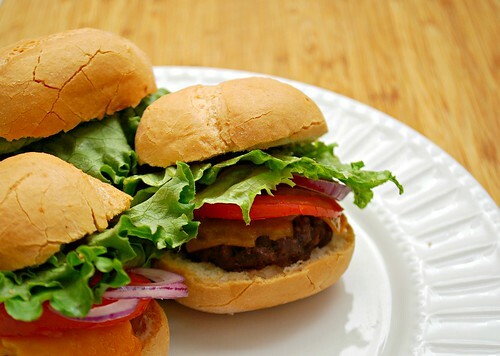 For these sliders, it helps to make them in a day early so that the beef can truly absorb all the flavor from the seasoning as well as the additional ingredients. That's really the secret to this recipe so the beef comes out really flavorful and juicy. This recipe makes 24 sliders but you can easily half the recipe. I would also suggest to make the full 24 slider recipe, using half for sliders and the other half as meatballs to serve with your favorite pasta dish. You can make the meatballs and freeze as well. If you wanted to involve the kids in the kitchen, they can help smash the burgers onto the baking sheet - Joel enjoyed this immensely lol. And I found that whenever he helps me make a dish, he's more likely to eat it when its on the table! Transfer meatballs to a baking sheet, spacing them out 2 inches apart. Carefully smash or press down on each meatball to form a patty. Spray the tops of each patty with cooking spray and bake in the preheated oven for 12-15 minutes. Remove sliders from oven and place on roll bottoms. Add your preferred garnishes and top with other half of roll. Maybe because it's the last week of August, but it just feels like slider weather. I would love to take a bite of that delicious concoction! The combination of all the ingredients in the hamburger just sound amazing!